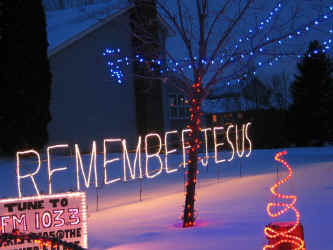 Our Remember Jesus sign was created by Mark Obermiller from Indiana. For a number of years, Mark had a very large Christmas display. You can see some pictures and information at his Computer Christmas Lights website. For his final display in 2002, he had nearly 150,000 lights, all synchronized to music via computer control and over 200 computer controlled circuits. More importantly, he treated his display as a Christmas Lighting Ministry — he used his lights as a ministry tool to remind others of the reason for Christmas, and the saving power of Jesus Christ. Although we never got to see the display in person, we were privileged to be able to enjoy several years of the display via video. In those days, before YouTube and ubiquitous internet video, Mark set up a “mailing chain” for those who wanted to see the video. You’d receive the VHS tape in the mail, view it, and then mail it on to the next interested person. Low tech, but effective! Mark’s lights and ministry inspired our display in a lot of different ways. First of all, the ministry aspect was something we had been doing in low-key ways for years, but seeing it done on such a grand scale kind of helped prove that we weren’t crazy! In the past friends from church would kind of look at us funny when we said that we treated our lights were a “ministry”, after seeing Mark’s display, and some of the testimonials on his website, I was able to show them that it wasn’t so crazy after all. Also, the way Mark computer-controlled his lights matched our style more than other computer-controlled displays we’d seen in the past. Lots of folks like to run only a few lights at once and have the computer cycle through them, emphasizing on thematic aspects (e.g. turning on Santa when mentioned in the music). Mark did these sorts of thematic things, but he also had thousands of lights on at any given time. We just happen to like the look of lots and lots of Christmas lights, and it was nice to see this could still be accomplished with computer control. 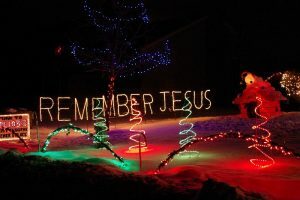 The Remember Jesus sign was prominently displayed in Mark’s Christmas display. The picture to the left shows the sign as it appeared in his display — high on the roof, with a large cross incorporated into it. 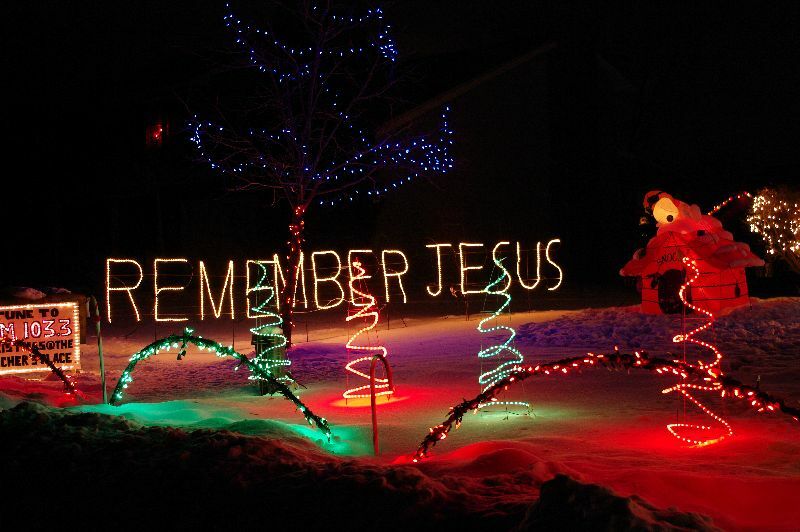 This sign always struck a chord with us — it was somewhat original and a slogan not found in most Christmas displays, yet it sort of summarized in two words why we decorated — we wanted viewers of our display to Remember Jesus during the Christmas season (for more on why we decorate, see this page). Unfortunately due to some family situations, Mark decided not to do a display in 2003, and sold off most of the display. 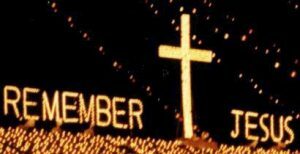 When we inquired about the Remember Jesus sign, Mark, who was familiar with our display and our reasons for decorating, graciously decided to donate the display to our own lighting ministry. We drove to Indiana as part of our vacation in September 2003 to pick up the sign, and added it to our display that year. In our display, it stretches along the side of our property, near our Peanuts Nativity Pageant. It’s a very large sign, and Mark had just reworked it with rope light for the 2002 season so it looked great. We animate the sign with computer control, synchronized to music along with the rest of our computer-controlled lights. The sign worked flawlessly through the 2012 season, but as we’ve been converting the display to LED lights over the years, and the rope light on this sign was over 10 years old, we decided to re-string the sign with new LED rope lights for the 2013 season. It looks virtually identical to the original sign, but uses significantly less power, and hopefully will be good to go for another decade or more. Incidentally, most of the lighted candy canes lining our driveway, and one of the large strobe lights in our display also originated from Mark’s display.